Three winters ago, husband and wife Frederico Ribeiro and Elena Liao did the thing that older couples would advise them not to do: They combined their passions and dumped all of their savings into a niche business, in this case a tea parlor, where they spend six days a week side by side. It’s not a tea parlor in the scones-and-Earl-Grey sense. 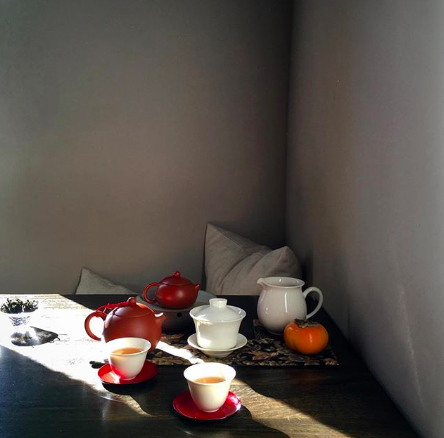 Liao only pours oolongs that she sources from farms in her native Taiwan. No milk. No sugar. And it’s not a restaurant, as there is no kitchen — not even a hot plate. 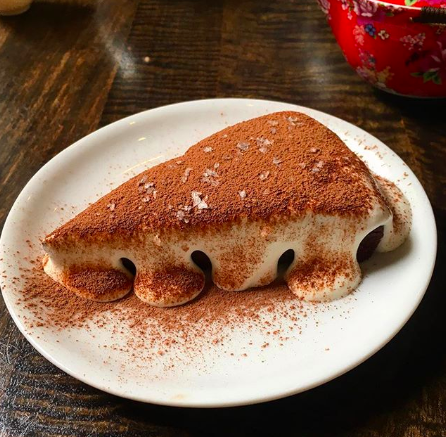 But Ribeiro makes food deserving of stars, informed by his years as a sous chef at Per Se and dictated by what he can serve at room temperature or straight from a dorm fridge. For all of the couple’s restrictions and expertise, there is no rigor or imposed vision. Only grace and humble curiosity. 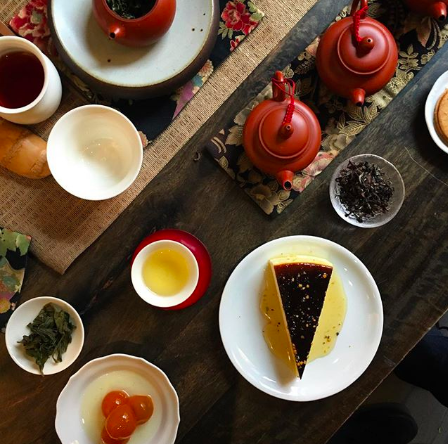 To step up into Té Company is to leave the city — and the century — entirely. The room has refined dark wood cabinetry and average gray tiled floors, which, combined with the twiggy floral arrangements and seasonal displays of, say, dried artichokes or persimmons in unexpected spots, give Té the feel of a gem you stumble upon in an apartment building in Tokyo. The minimal size — four tables and a compact club chair, plus a retail area where people wait for tables on weekend afternoons — feels Asian, too. The music, however, is Old Village, seemingly set to the Blossom Dearie Channel, with an occasional Ella assist. The tea enhances the out-of-Manhattan experience. The world telescopes when contemplating how there can be so many variations stemming from a single style of tea grown on one island. A fist-size clay teapot, a red silk braid tethering the lid, might hold a few ounces of smoky Frozen Summit, while a fine porcelain vessel is filled with the exquisite fluke that is Oriental Beauty Reserve, its aphid-blighted leaves yielding a floral, full-bodied infusion more akin to a fine wine. 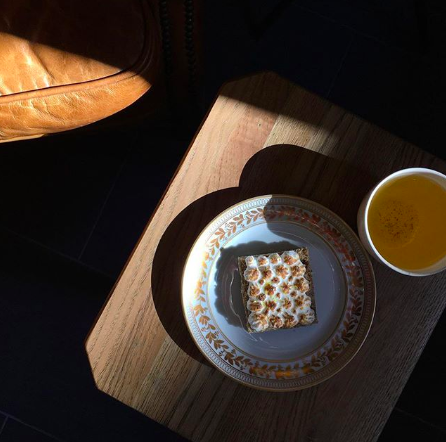 Fittingly, the tea menu reads like a wine list — campfire, leather, toasted hay — with Liao serving as cheerful sommelier. Because a pot of oolong can be steeped up to six times, lingering is a given, if a crummy business model. Use this time to order everything on the miniscule menu, available after Ribeiro lugs his tote of Tupperware over from a borrowed kitchen up the block around noon. The slight of hand in his make-believe kitchen is magical. Although it has dropped from the menu, his Spanish egg tortilla was so creamy and perfectly blond that Le Bernardin chef Eric Ripert tried to put it on his, telling Ribeiro that “Ferran Adría could not have made a better one.” In the interest of variety (and sanity), Té now offers a daily Taiwanese pork bowl, masterful rice topped with sweet-sticky caramel pork, tea-soaked daikon pickles, fried shallots, cilantro, and, if you’d like, a soy-marinated egg. 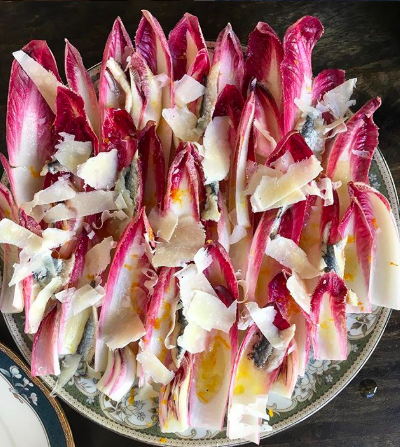 Brave, anchovy-lashed market salads are stacked leaf by leaf. Garlicky discs of cucumber take on a jewel-like display. Even out-of-the-package cured meats and tinned seafood are of a quality that no schmo will ever be able to source. Perhaps that’s why you might see chefs from around the world here, eyes closed, nodding in recognition as they disappear into that tea-drunk pleasure zone that is Té Company. Everyone gets that look during dessert, which could be a satiny steamed (!) chocolate cake almost hidden beneath a ruff of crème fraîche or their trademark pineapple linzer cookie, finished with yuzu zest and flaky salt to order, which you will taste and immediately order another to go. But leaving is hard. New York is still out there.